Theologian Thomas Burnet’s Theory of the Earth ‘initiated a lively tradition of scientific treatises on the origins of the earth’. First published in Latin in 1681, the frontispiece, here, appeared in the 1684 English translation. The image was included, albeit modified, in all subsequent editions; and as Magruder says is ‘so effective a summary….that his [Burnet’s] views frequently are described simply by reference to this engraving’ (2008). Here we see Jesus Christ standing atop seven globes, clockwise they each represent a stage in Earth’s development. Earth in chaos; Earth as perfect, featureless; Earth in the Great Flood, with the Ark; Earth as we know it; Earth in conflagration; Earth perfect again; and finally Earth has become a star. 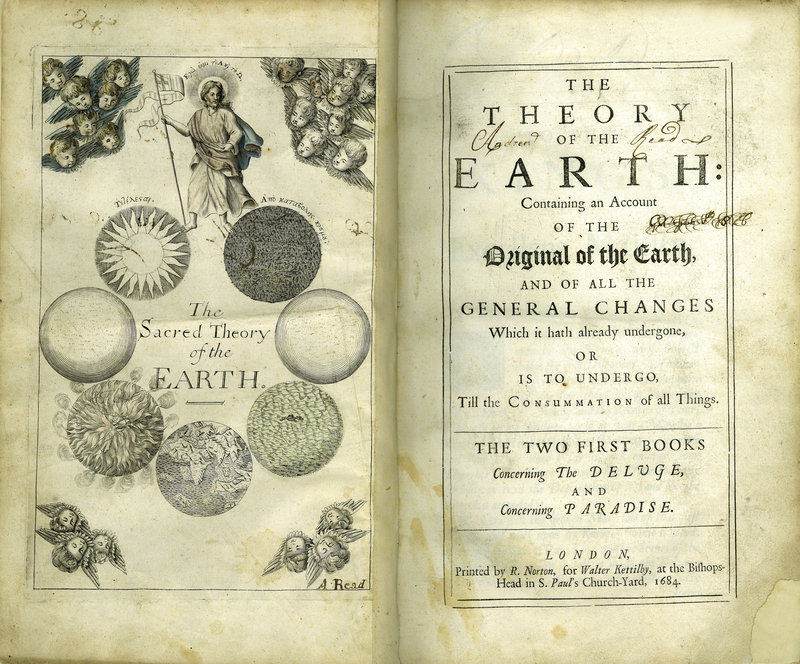 [Thomas Burnet], “The Theory of the Earth,” ourheritage.ac.nz | OUR Heritage, accessed April 24, 2019, http://ourheritage.ac.nz/items/show/10713.